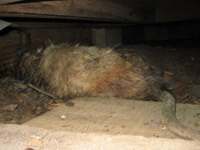 I had to pry up attic floorboards for this dead opossum. 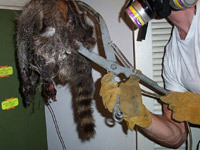 I removed this dead raccoon from inside the air handler! 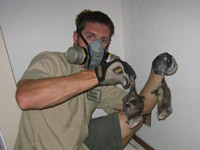 This is your standard dead squirrel in the attic removal. 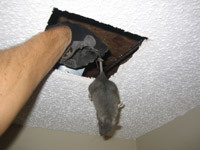 This is a regular dead rat removal from an attic. 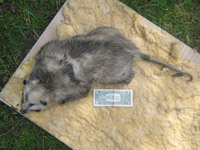 Look at this dead opossum that I removed from the ductwork under a house. 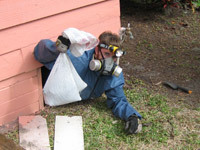 Here I am emerging with a dead mystery critter under a house. 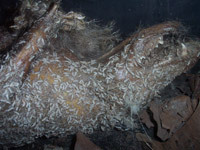 Some baby opossums fell down a wall from the attic, and they died. 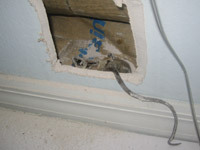 I cut a hole inside the closet to remove this dead opossum in a wall. 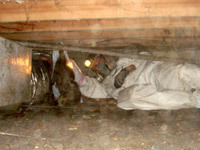 A common sight - a dead opossum under a house. 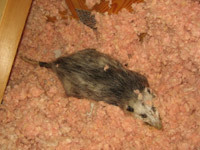 Opossums also commonly live and die inside attics. 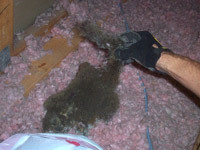 Here's a dead squirrel in an attic - what a stench! See those blue/green droppings? 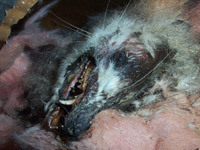 Someone poisoned this rat! 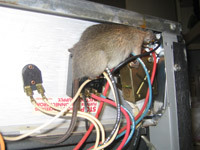 Dead rats get everywhere - I removed this one from the back of a stove. After a long search I got this one out of the breaker box! 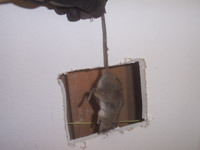 I commonly cut dead rats and mice from out of walls. 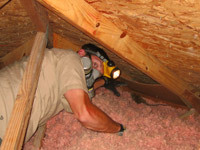 If there's no attic space, I have to cut the dead rat out of the ceiling. 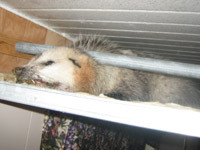 Here's a lovely sight - a dead opossum in a drop ceiling. Look at the size of this one - the stench in the house was unbelievable. 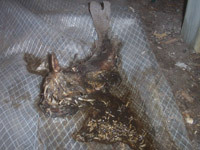 I cut this dead opossum out of the vapor barrier under a mobile home. The crawl to this was very difficult and unpleasant - but the aroma can't be beat! 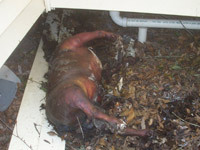 I removed this dead wild boar from someone's yard. 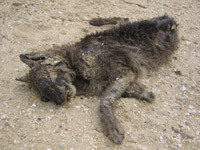 Here we have a dead dog, a pit-bull, that I removed from under a house. Here's a dead bobcat that I removed from a golf course sand trap. I actually found this dead catfish under a house. Oh the fun! 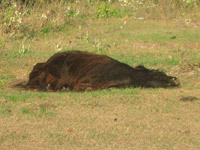 I had to use a chainsaw and 40 wheelbarrows to remove this dead cow. 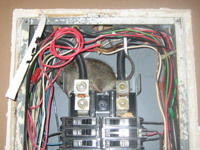 Here's your standard dead rat in a wall removal. I find 'em! 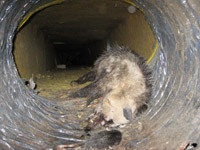 Here's a dead opossum inside the duct work of a house - the stench! 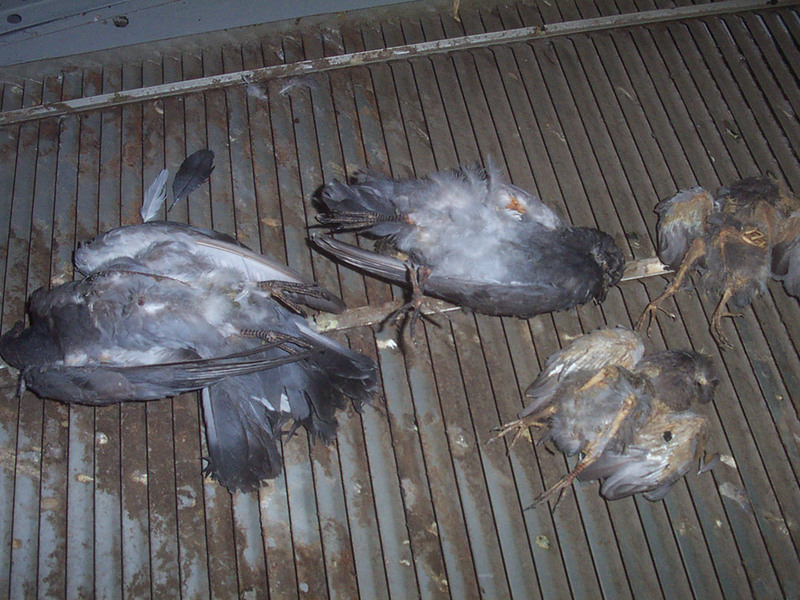 Here are some dead pigeons that I removed from the ducts of a school. 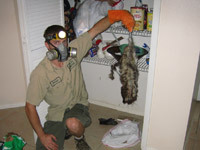 I operate a professional wildlife removal business in Orlando Florida. 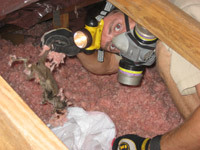 It is not a pest control or extermination company, nor is it the county animal control. 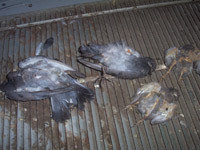 It is a privately owned nuisance critter and wildlife control business. 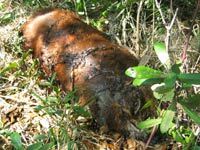 I have removed hundreds of dead animal carcasses over the years. These are some of the photos that I've taken in the field. 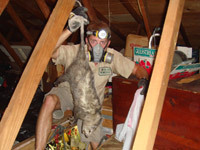 I do all aspects of pest critter removal, but I specialize in dead animal removals. 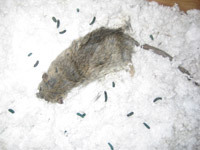 Whether you have a dead animal in the attic or a dead animal under the house or a dead rat in the wall or ceiling I can find and remove it.